Leaks in the exhaust manifold produce bad exhaust values, a loss of power, and increased fuel consumption. 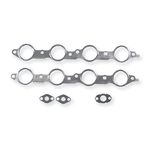 Mahle Original exhaust gaskets require metal beads where the gas passes through at very high temperatures and low pressure. These metal beads are reinforced with metal sheets to resist the component movement that arises from large fluctuations in temperature. Maintains all OE tolerances and requirements. Polymer coated for positive fluid seal. Lower clamping force means less bore distortion.